A surprisingly strong jobs report last week added further momentum to a rise in interest rates since the first of the year. Generally mortgage rates will go the opposite direction of the stock market and follow the path of 10 year treasury bonds. As there is optimism in the overall economy investor funds flow from bonds into the equity markets – a selloff of bonds causes the price decrease and thus yield or rates increase. With the exception of a few positive bounces – the trend for bond prices is down in 2013 resulting in 0.250% – 0.375% increase in mortgage rates. I do not see anything that will change the momentum we now see in the economy – the economy is certainly not fully recovered, but is headed in a positive direction after several years of dismal performance and outlook. The Fed has been actively involved in purchasing mortgage-backed securities which has helped keep rates low. With improvement in the unemployment rate and outlook for an economic recovery the consensus is Fed will be looking to curtail this program and ease its way out. One less significant player purchasing mortgage-backed securities will cause bond prices to drop in rates to rise as well. 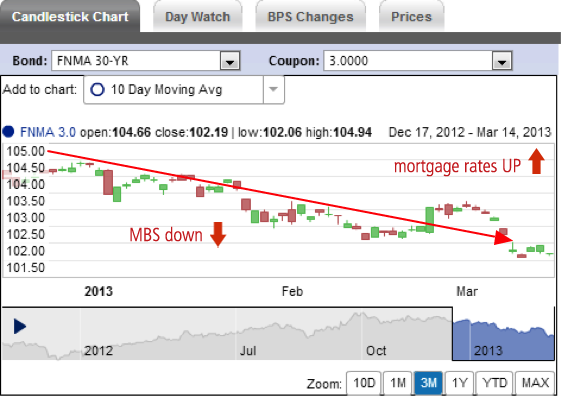 Mortgage rates are still very close to historical lows. One of my favorite refinance options is to take an existing 30 year fixed mortgage even when the client is 10 years into it – and convert that to a 15 year mortgage. The payment remains approximately the same and takes 4 to 5 years off the mortgage!